Flavors of the ocean, pure and simple. An atmosphere intimate, rustic and warm. A loud welcome of irasshaimase echoes around as you step into this comfortable family-run space with a history of over 40 years. Once the home of a sushi legend, this two-star Michelin sushi restaurant thrives on the energy and vitality of its young chef. 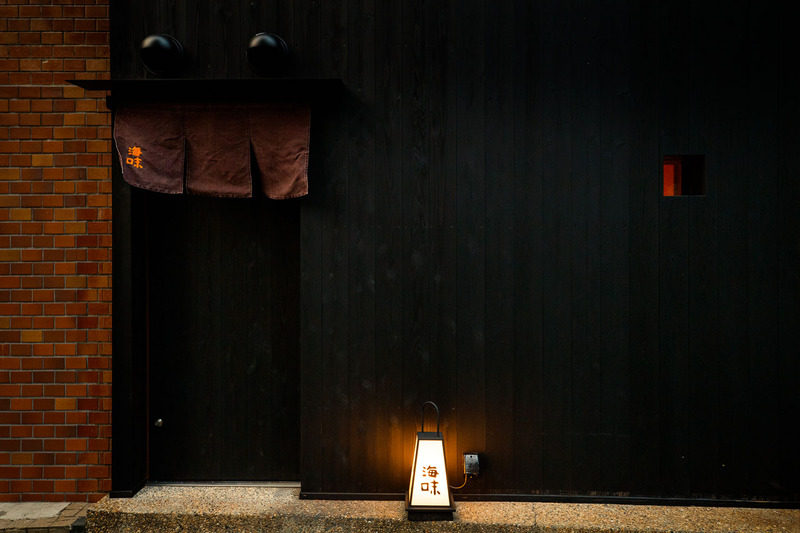 A short walk from Gaienmae metro station against the backdrop of black painted timber, a crisp white noren hangs above the wooden entrance with calligraphy characters for ‘ocean’ and ‘flavor’, read as “Umi”. Entering the intimate and welcoming interior, you find contrasting tones of timber in the warming dark walls and the pale, clean counter. The walls are adorned with traditional samurai swords and ecru seat covers give the interior a somewhat rustic feel, almost like being in someone’s home. Stacks of variably shaped dishes are within arms-length of the chef who busily works behind the counter entertaining guests, who wait in expectation for the next delicious morsel to reach their plates. 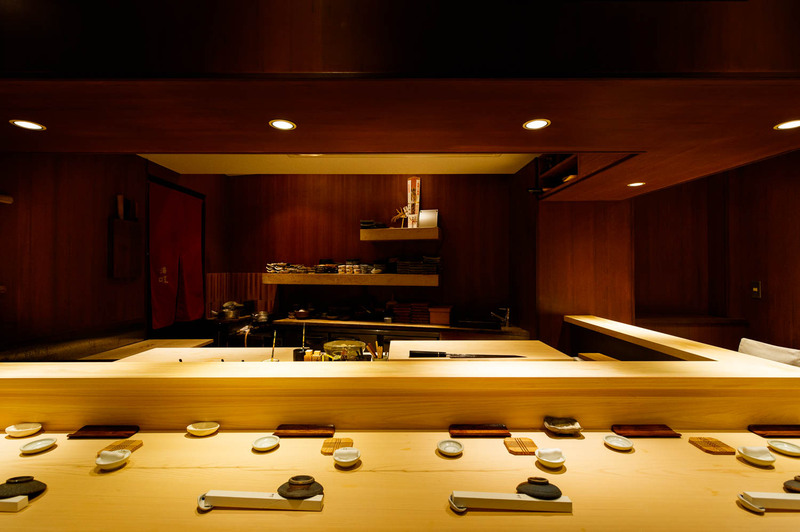 Along the main counter that seats eight and two cozy tables, small wooden “reserved” signs show the sushi chef has been awaiting your arrival. True to its name, Umi serves the best of the ocean’s blessings. A generous course including appetizer-like dishes showing Chef Nakamura’s versatility and skill, the focus is on ever more nigiri sushi as the chef seeks to return to his roots. The source of daily ingredients varies widely, taking you on a tour through the ports of Japan. 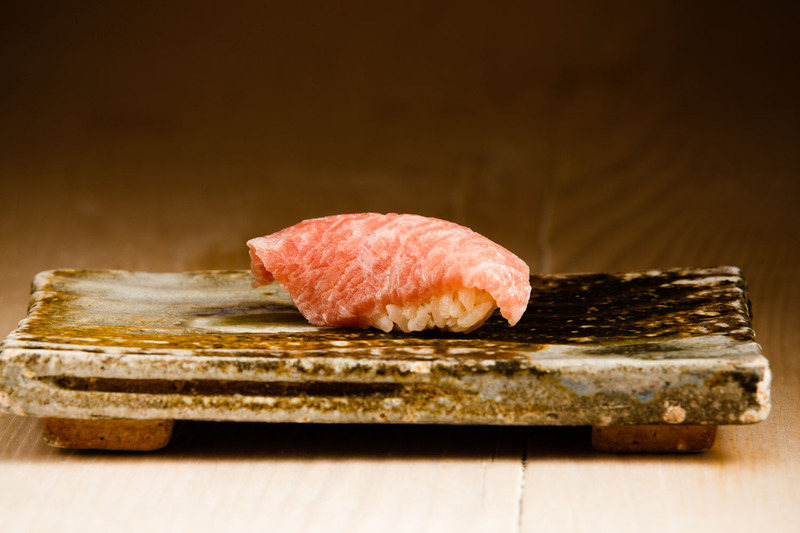 You can enjoy chutoro from Funka Bay in Hokkaido and otoro fatty tuna from Oma Port in Aomori. The chef’s intricate knife skills highlight the beautiful delicate pattern of kisu Japanese whiting from Futtsu, Chiba. 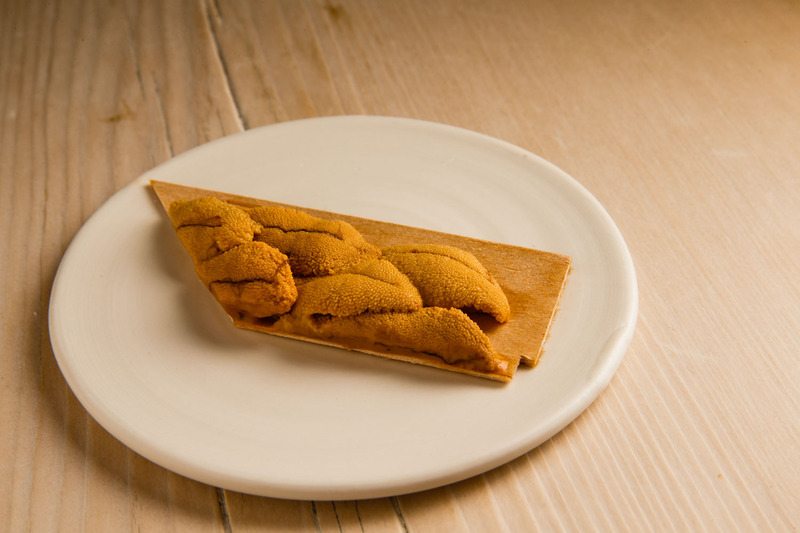 Served in gunkan-maki style wrapped in crisp aromatic nori seaweed is melt-in-your-mouth, plump orange pieces of bafun-uni sea urchin from Yoichi to the west of Sapporo, Hokkaido. 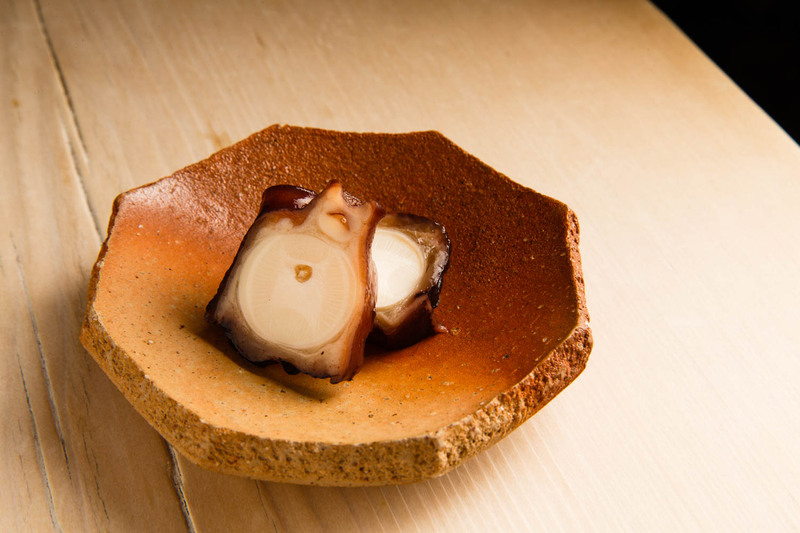 Juicy, tender abalone from Ohara, Chiba, sits on a wooden dish elevated on an octagonal pedestal, and the striking purple surface contrasts with the creamy flesh of simmered octopus from Yokosuka. 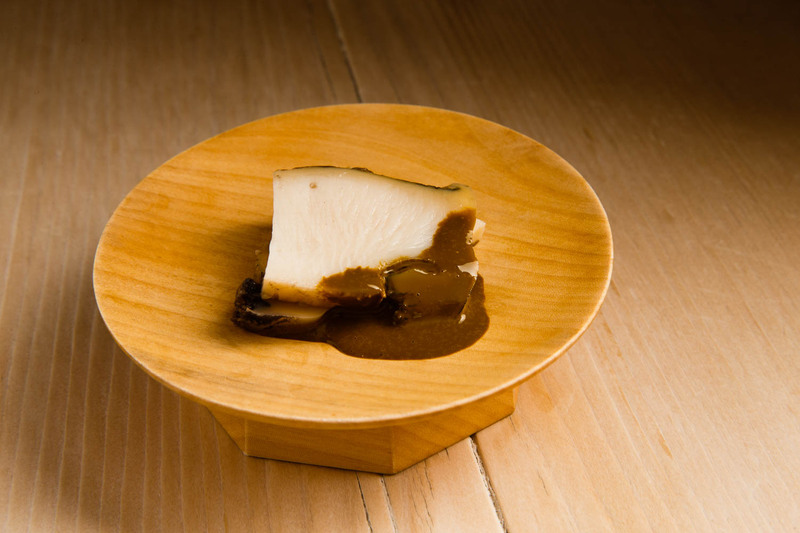 And then the chance to savor yet another variety of sea urchin – akauni from Karatsu, Saga – pieces layered on a wooden platter ready to be devoured. Chef Nakamura personally selects all his ingredients. His search for the best begins every night when he calls his trusted suppliers with requests. Final decisions are made on arrival at Tsukiji Market the next morning, when Nakamura purchases his preferred fish and shellfish from among what has been set aside for him. The menu for cooked dishes that intersperse the meal changes monthly, expressing a significant sense of the season. He is very grateful to the suppliers who have continued to work with him even after his master Chef Nagano’s death, supporting him and his quest for perfection. Nakamura’s rice is a combination of Koshihikari and Sasanishiki varieties, originally from the Hokuriku and Tohoku regions, respectively. It is a mix the chef created to achieve the perfect moisture content for the shari oval bases on top of which the sliced fish rests. Seasoned with a mixture of red and rice vinegars, the result is sushi that unfolds for delicious flavor with every bite. 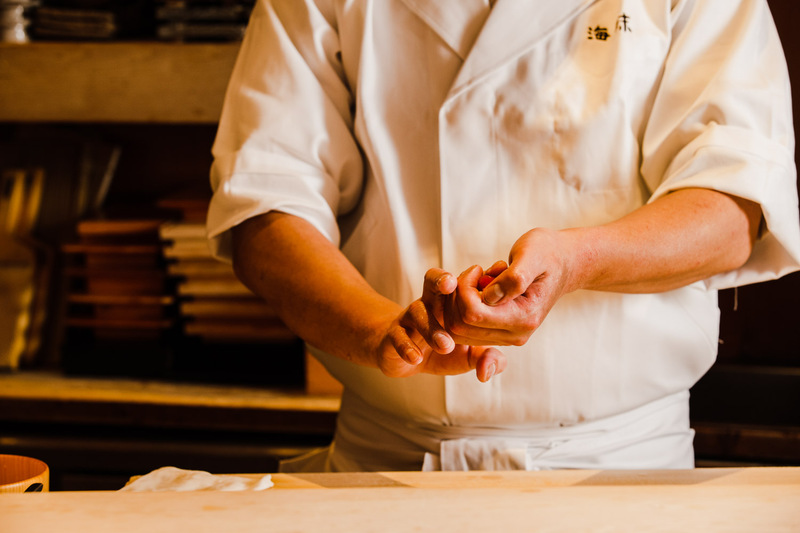 The story behind Umi centers on Hokkaido-native and sushi legend Chef Nagano. At the helm of Umi for more than 20 years, together with sushi master Nakazawa, Nagano was responsible for developing many of the latest trends in sushi. But in 2015, he was struck down by illness and died far too young. The world of sushi still had much to learn from him. 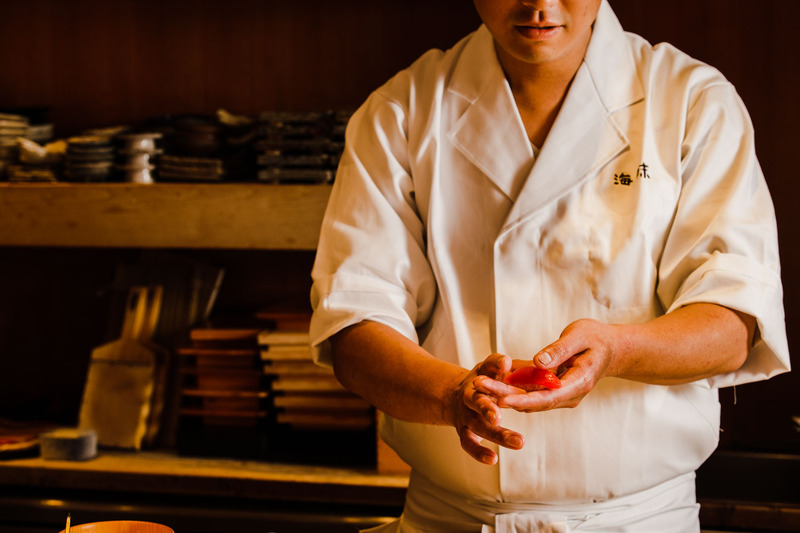 One of his biggest gifts to his apprentices was teaching them to shape sushi not with their skills but with their hearts, and this is a major reason for Ryujiro Nakamura’s success, having taken over Umi at just 28 years old. Nakamura was born in Tokyo into the world of cuisine, but his sights were set not on the family’s Chinese restaurant business; instead he dreamed of becoming a sushi chef. He was keen to start sushi training immediately after junior high school, but reluctantly finished high school at his mother’s urging. On graduation, he headed straight for his grandfather’s hometown of Kanazawa, with the conviction that if you don’t experience regional Japan when you are young, you will never go. After five years training at the large-scale Aoi Sushi in Kanazawa, Nakamura returned to Tokyo to Hagihara in Ginza for two years. Developing deep respect for Chef Nagano and his famed Umi, a chance sighting of a hiring ad gave him his chance to join the Umi kitchen at age 26. Nakamura found his stride working in a dream team under Chef Nagano with sushi chefs who now run the acclaimed Amamoto at the foot of Tokyo Tower and Sushi Sakai in Fukuoka. And he accompanied Umi in its move to the new location in Aoyama. But with Chef Nagano’s untimely passing, suddenly Nakamura was in charge. Confident in his ability, he took the reins, and skillfully serves up seafood delicacies to the delight of customers new and old. As he delves deeper, he feels the pressure of the legend whose shoes he is trying to fill, but with support from family and his hard-working and energetic team, Nakamura has created a very friendly and warm sushi restaurant. Nakamura works hard to raise his apprentices and would love to see them open their own sushi restaurants. A rather strict boss during working hours, he loves to invite everyone over for barbecues on free days so he can relax with the people in his team. 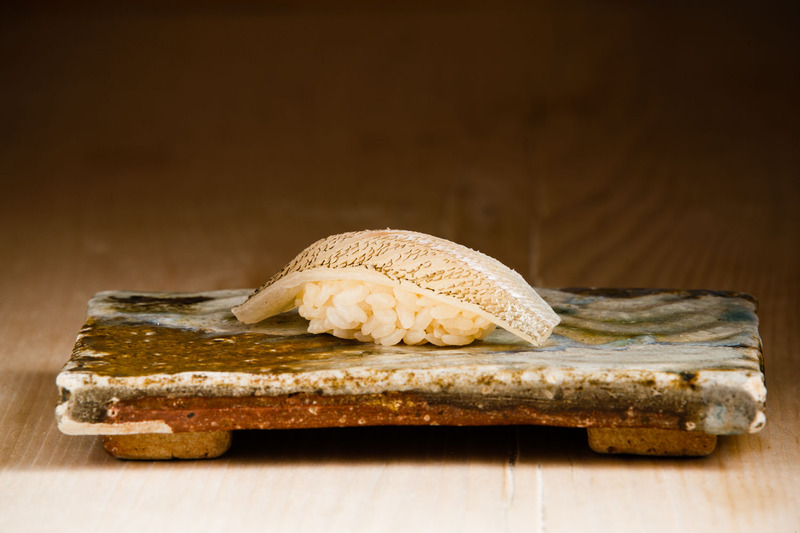 Nakamura still feels very young in the world of cuisine, but one day dreams of having a restaurant of a different style, perhaps in Kanazawa, to which he still feels a strong emotional attachment. 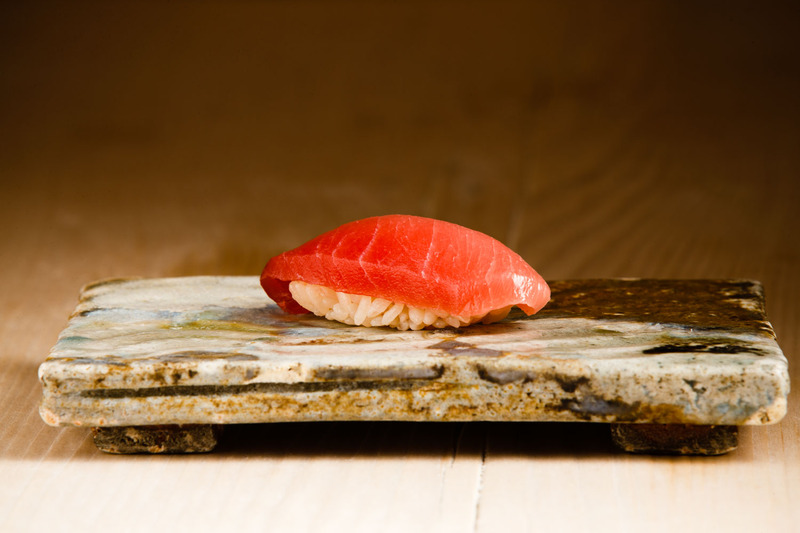 One thing that will never change at Umi is the ceramic tableware used to present sushi. With dark greens and browns and a thick earthy quality, the pieces have a touch of blue bringing a sense of the ocean inside. Another dish is a collection of squares that resembles the skin of a crocodile. Once course may be presented on red-brown earthenware with jagged edges, followed by another of smooth and pure white lines to highlight the deep yellow tones of plump uni. 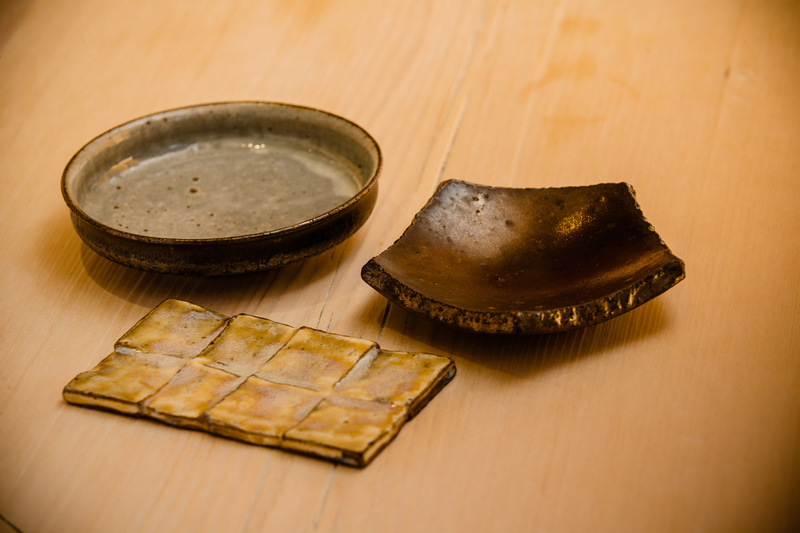 Visiting exhibitions from time to time, Nakamura purchases all his tableware according to personal taste, with no leanings to a particular style or potter. One of his favorite items is a tall white porcelain cup. 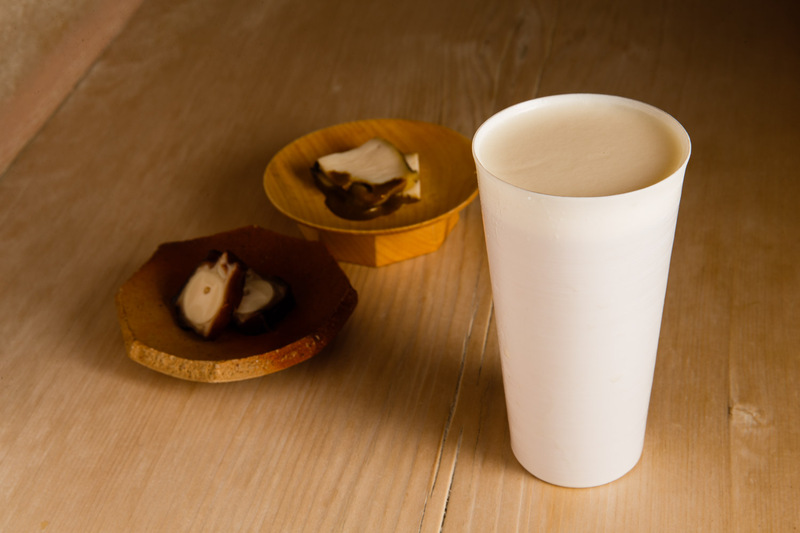 An Arita-yaki piece known as eggshell, Nakamura is especially fond of the delicate lip and the perfect velvety foam created when a refreshing cold beer is poured.